It's a wonder anyone would agree to be a juror for an art exhibition. Imagine having to sit at a computer loaded with more than 1,200 images from which you must select 50 or so. While Elizabeth K. Garvey, the juror for this year's Delta Exhibition at the Arkansas Arts Center, didn't look at them all at once -- who could? -- she says it's a process she enjoys. "I would sit down and see if I got into a flow with it. The easiest, yet hardest part is weeding the images. It's tedious. I felt I had quadruple vision at times. I [took out] more than half in the first cut. If an entry had sloppy errors -- not listing the medium of the work, for example -- they were out. "Saying a work is mixed media doesn't tell me a lot. I'd like to know what the actual media used is. That gives me a better sense of texture and other qualities that don't come across in a two-dimensional image." Detail shots of the artwork also help a juror assess it, she says. Garvey, director of Garvey/Simon Art Access in New York, approaches the juror's role more from her response to the work than the technique of the artist. "I think you have to be more visceral," she says. "That's one of the reasons why some artists didn't make it into the Delta and some didn't win an award. As compelling as some works were, they were all about technique. I do appreciate a certain degree of craft, of technique; I don't like work that's sloppy or not well made." Garvey chose 52 works for the Delta, which opens June 10 at the Arts Center. "I had weeded the exhibition down smaller than I should have, into the high 30s. So, I had to think about what to put back in. Some of the artists had something to say; I wanted to see their work in the context of their work." That's why several have more than one work in the exhibition. 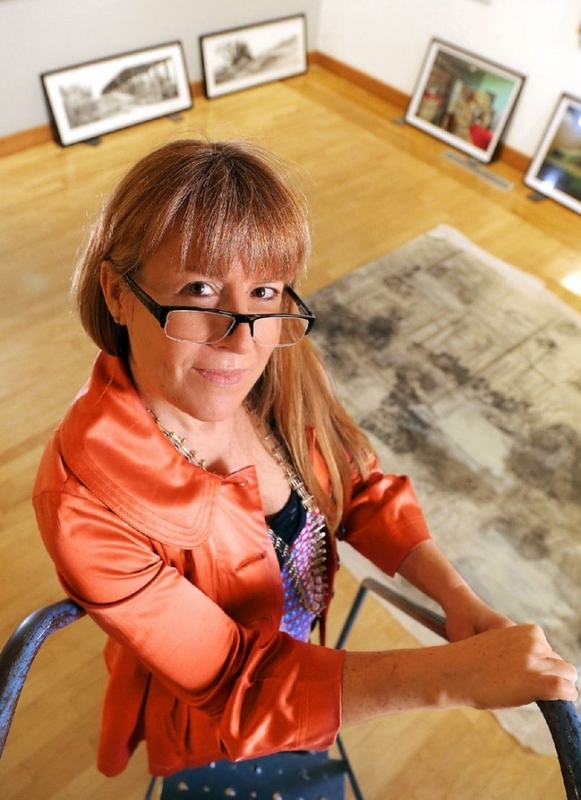 "I wanted to give them more than the one shot most juried shows offer," Garvey says. "I wish I could have chosen artists rather than pieces. There were a lot of great artists who submitted their work. The award choices were very difficult. At the end of the day, it was my gut. 'What do I want to see again?'" Garvey, who grew up near St. Louis, said a show she saw as a child of cut paper pieces by Matisse "was a pivotal thing. I didn't enjoy a lot of art museums as a child, but that one was very interesting to me." Her attention to art waxed and waned until college. Initially intent upon a career as a graphic designer, she switched to art history at Indiana University, where she earned her bachelor's degree. She did her graduate studies in art history at Hunter College of The City University of New York. She has been a fine art dealer and adviser in New York for more than 20 years. "My passion in school was Renaissance art, especially early northern Renaissance painting. It is still the lens with which I look at things. I loved art history, I loved learning history through art. It was looking, discovering and learning that became far more enjoyable than trying to force my hand to do something. I learned an appreciation for what is done to achieve results in art." Whether Garvey is working with clients, in her gallery or being a show juror, art for her comes down to one word. "It's all about relationships," she says. "I hope the public gets to know these artists; it's a relationship that could benefit them both." ''The 58th Annual Delta Exhibition,'' June 10-Aug. 28 with a members and artists preview and lecture by juror Elizabeth K. Garvey on June 9. Arkansas Arts Center, MacArthur Park, East Ninth and Commerce streets, Little Rock. Information: arkarts.com.